Looking around Avingard notices that the second level he recently fought the three Stormcloaks extends the width of the room. Above the passageway that Legate Rikke is reluctant to walk through has a ledge directly above it, and Avingard wonders if another passageway is above. Avingard makes his way back to the steps and then ascends them to the ledge above. He makes his way along the ledge until he is directly over Legate Rikke. His instincts were correct. Almost directly above the passageway below was a second passage that he could use to bypass the one below. Readying his sword, Avingard slowly walks the new passage until he comes to a large room. Just as he enters, four Stormcloak soldiers notice his presence and begin to ready their weapons. Since the Stormcloaks were a little below Avingard they couldn’t reach him before the other legionnaires – alerted by the Stormcloaks – came rushing through the passage and into the room. Before Avingard can descend down to join the battle, all four Stormcloaks lay dead on the ground. Making their way to the location where the Stormcloaks were, Legate Rikke leads the legionnaires through a doorway. Just as they enter a well-lit room, a lone Stormcloak soldier rushes at the group of Legion soldiers. Before anyone can react, Avingard swings his large sword, striking the Stormcloak soldier dead. The rest of the legionnaires sheath they weapons after realizing no other Stormcloaks were present. After advancing further in the temple, the legionnaires come to a door. They open the door and find themselves in Korvanjund Halls. Just as they enter the new part to Korvanjund, two Stormcloaks – one with a two-handed sword, and another with a two-handed axe charge the group of Legion soldiers. The first Stormcloak is felled by Legate Rikke and Avingard, while the second is killed by the other legionnaires. 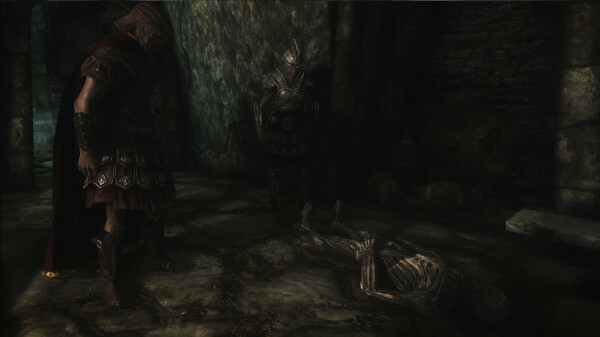 After dispatching the two Stormcloaks, the legionnaires enter another room where Legate Rikke notices a Draugr on the floor. Then pass through a small door and then turn right. As they continue further they come to a well-lit and wide passageway. On either side of the room were carvings, and an unusual door was at the other end. Below the door were to dead Stormcloak soldiers. “And this must be the Hall of Stories,” Legate Rikke explained. “Oh…I’ve heard of this. These walls are supposed to show the history of the ancients who built this place,” one legionnaire said. Legate Rikke approaches the door and quickly examines it. The door consists of three rings, each with a carving and a center circle with three holes and what looks like a claw. Avingard looks at the door, and then looks around. Somehow he figures that the two dead Stormcloaks are somehow connected with the door. 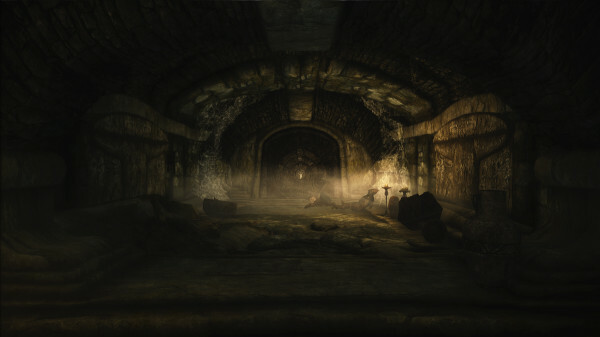 Looking closely at the floor near the Stormcloaks, Avingard notices a claw-shaped object lying near on of the bodies. He picks up the claw and examines it closely. On the palm of the claw Avingard notices the same carvings as those on the door. There were three carvings on the claw, which probably means that each one pertains to a carving on a ring on the door. Avingard approaches the ring and then turns the ring so the the top ring shows a wolf, the middle ring a moth, and the bottom ring a dragon. He then places the claw into the three holes in the middle circle and within seconds the door makes a noise and slowly lowers. The group of legionnaires enter a room that is well-lit from above. Ahead is a barred door. Legate Rikke moves to inspect the door, and notices that it is locked with no sign of a way to unlock it. She turns to face the Legion soldiers. Once again Avingard sets out to look for a solution to another problem. He notices a passageway leading off to the right. He follows the passage upwards until he is looking down on the legionnaires. He continues to walk looking for a way to open the door. He spots a dagger placed alone on a small pedestal. Avingard picks up the dagger, and as he does so the center section of the pedestal raises up. Suddenly, the noise of moving stones can be heard to his left, and he walks around to notice the wall opening up. Intrigued, Avingard walks through the new doorway and along a small passage. At the end of the passage Avingard spots a chest. Unsure of traps, he looks around and notices holes in the floor. He walks across the floor, carefully avoiding the holes, and backs into a corner, but within easy reach of the chest. He slowly opens the chest, and just as he does so, long, sharp spikes shoot out of the ground, barely missing him. The spike return into the floor as quickly as they appeared. Avingard looks in the chest and notices an Orc bow, some gold, a healing potion and other treasures he can easily sell. With the chest now empty, Avingard makes his way out of the room and back down the passageway to where he found the dagger. He must still find a way to open the gate, so he makes his way along the upper level until he comes to the end. Looking around the back wall Avingard finds nothing. He turns to return and then notices a round pull-like lever in a dark part of the wall. Avingard pulls the lever and suddenly notices the gate on the lower level open. Unfortunately, not only does the gate open, but also some standing crypts that were in the room, as well. Five Draugrs slowly make their way out of the crypts and charge the legionnaires. Avingard attempts to rush down to help his Legion brethren, but by the time he makes it down the stairs, the Draugr have been dispatched. The legionnaires then make their way through the newly-opened gate. After walking down a short passage they enter a much larger room with ornate sculptures on either side of a throne-like chair, with a lone Drauge slumped over in the chair.